Sean Ireland, the first gay presidential candidate in US history, is guaranteed the election—until he’s found dead at the Palace of Fine Arts in San Francisco. Stunned by her friend’s murder, private investigator Darcy McClain is determined to hunt down Sean’s killer. In shock, she returns home to find someone has broken into her home, assaulted her sister, and stolen Bullet, her giant schnauzer. While frantically searching for Bullet, Darcy’s worst fears are realized. She finds a tranquilizer dart, shot from a crossbow, lying in her backyard. Only one person she knows uses such a weapon—Solis, a rogue CIA agent who years earlier tried to kill Darcy. After Sean’s death, more grisly murders follow, leading the police to suspect a serial killer. Darcy isn’t convinced. But before she can pursue her hunch, she is framed for Sean’s death. On the run from the law, she’s forced to go underground to solve the murders and to get Bullet back. In the course of her investigation, she’s astounded to discover evidence of a high-level government conspiracy to exterminate gays and lesbians. Thousands are already dying horrible deaths. Is Solis part of the conspiracy? Is he the murderer? Taunted by Solis, who threatens to kill her dog, Darcy vows to track down her adversary, save Bullet, and discover the truth. In a tale of dark intent and evil conspiracy, not even a presidential candidate is safe from a homophobic group intent on committing the mass murder of homosexuals. Their weapon of choice? A pharmaceutical kiss of death. Private Investigator Darcy McClain, a close friend to the late candidate will find the murderer come hell or high water, but she comes home to find a horror that will steel her resolve even more. Her home has been broken into, her sister assaulted and her closet friend in all the world, Bullet, her giant schnauzer is gone. Trust me, you do NOT want to come between a woman and her dog and the hunt is on…with evidence pointing to her arch nemesis, Solis, a former CIA agent gone bad who had his chance to kill Darcy once and failed. Thousands of innocent gays and lesbians are dying and Darcy will stop at nothing to uncover this heinous and twisted crime. Determined to find justice for the dead, punish those entrusted with the country’s welfare and save Bullet, Darcy plays killer tag with those in power and the one monster she would like to wipe off the face of the earth. 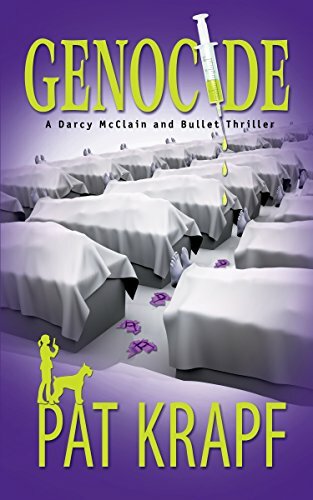 Forget sitting back for a relaxing escape, Pat Krapf’s GENOCIDE is a fast-paced and twisted tale of corruption, bigotry and the power over selected death. Follow Darcy as she digs for the truth, the villains and Bullet, dodging death and imprisonment for a murder she didn’t commit. An excellent action-packed mystery-thriller that touches on appalling hate crimes, twisted science and a loyalty that defies species. I received an ARC edition from Pat Krapf in exchange for my honest review. Your review has encouraged me to read this book. Thank you for sharing your thoughts.